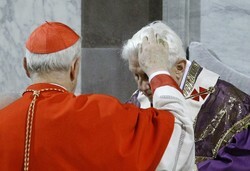 The last sentence of Pope Benedict’s Wednesday audience today gives us a clue as to the reason why we begin a religious season of conversion, a yearly season of purification, he says: “40 days of intense prayer and sincere penance, to be able to celebrate, purified and completely renewed in mind and spirit, the great mystery of her Son’s Easter.” This is the point of ashes, penance, prayer, fasting, alms-giving–Easter! NYC churches, as one example of a large urban center, seemingly have millions of people filtering through the churches on Ash Wednesday. Certainly, the Cathedral of Saint Patrick saw 40-50 thousand people today and Saint Agnes Church saw about 7 thousand people come for ashes. It’s tiresome to stand all day imposing ashes on gizilions of people repeating person-after-person the formula, “Remember that you are dust and dust you shall return.” BUT it was good work for the Lord and for our sisters and brothers. On a personal note, I prayed my rosary and made my morning offering today for all the people upon whom I placed some ash as a token of the journey of conversion they’ve begun today by moving to the Last Supper, calvary and then unto empty tomb unto their salvation. The Pope’s homily today is another wonderful piece of practical theology moving us to the center of faith in Jesus Christ. Today, Ash Wednesday, we begin the Lenten journey: a journey that extends over 40 days and that leads us to the joy of the Lord’s Easter. 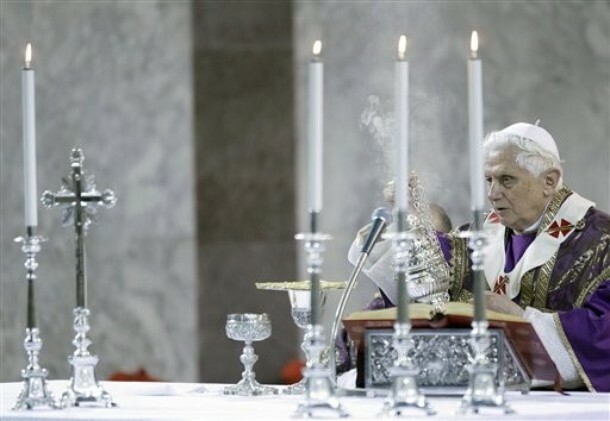 We are not alone in this spiritual itinerary, because the Church accompanies and sustains us from the start with the Word of God, which encloses a program of spiritual life and penitential commitment, and with the grace of the sacraments. The first call is to conversion, a word that must be taken in its extraordinary seriousness, discovering the amazing novelty it contains. The call to conversion, in fact, uncovers and denounces the easy superficiality that very often characterizes our way of living. To be converted means to change direction along the way of life — not for a slight adjustment, but a true and total change of direction. Conversion is to go against the current, where the “current” is a superficial lifestyle, inconsistent and illusory, which often draws us, controls us and makes us slaves of evil, or in any case prisoners of moral mediocrity. With conversion, instead, one aims to the lofty measure of Christian life; we are entrusted to the living and personal Gospel, which is Christ Jesus. His person is the final goal and the profound meaning of conversion; he is the way which we are called to follow in life, allowing ourselves to be illumined by his light and sustained by his strength that moves our steps. In this way conversion manifests its most splendid and fascinating face: It is not a simple moral decision to rectify our conduct of life, but it is a decision of faith, which involves us wholly in profound communion with the living and concrete person of Jesus. To be converted and to believe in the Gospel are not two different things or in some way closely related, but rather, they express the same reality. Conversion is the total “yes” of the one who gives his own existence to the Gospel, responding freely to Christ, who first offered himself to man as Way, Truth and Life, as the one who frees and saves him. 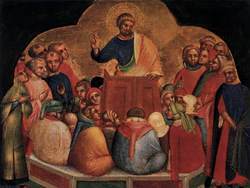 This is precisely the meaning of the first words with which, according to the Evangelist Mark, Jesus began the preaching of the “Gospel of God.” “This is the time of fulfillment. The kingdom of God is at hand. Repent, and believe in the Gospel” (Mark 1:15). “Repent and believe in the Gospel” is not only at the beginning of the Christian life, but accompanies all its steps, [this call] remains, renewing itself, and spreads, branching out in all its expressions. Every day is a favorable moment of grace, because each day invites us to give ourselves to Jesus, to have confidence in him, to remain in him, to share his style of life, to learn from him true love, to follow him in daily fulfilling of the will of the Father, the only great law of life — every day, even when difficulties and toil, exhaustion and falls are not lacking, even when we are tempted to abandon the following of Christ and to shut ourselves in ourselves, in our egoism, without realizing the need we have to open to the love of God in Christ, to live the same logic of justice and love. In the recent Message for Lent, I wished to remind that “humility is required to accept that I need Another to free me from ‘what is mine,’ to give me gratuitously ‘what is his.’ This happens especially in the sacraments of reconciliation and the Eucharist. Thanks to Christ’s action, we may enter into the ‘greatest’ justice, which is that of love (cf. Rm 13, 8-10), the justice that recognizes itself in every case more a debtor than a creditor, because it has received more than could ever have been expected” (L’Osservatore Romano, Feb. 5, 2010, p. 8). The favorable moment and grace of Lent shows us the very spiritual meaning also through the old formula: “Remember man that thou art dust and unto dust thou shalt return,” which the priest pronounces when he places ashes on our head. We are thus remitted to the beginning of human history, when the Lord said to Adam after the original fault: “By the sweat of your face shall you get bread to eat, Until you return to the ground, from which you were taken; For you are dirt, and to dirt you shall return” (Genesis 3:19). 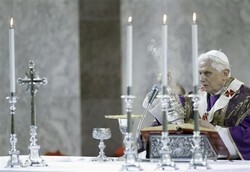 Man is dust and to dust he shall return, but he is precious dust in God’s eyes, because God created man for immortality. Thus the liturgical formula “Remember man that thou art dust and to dust thou shalt return” finds the fullness of its meaning in reference to the new Adam, Christ. The Lord Jesus also wished to freely share with every man the lot of frailty, in particular through his death on the cross; but precisely this death, full of his love for the Father and for humanity, has been the way for the glorious resurrection, through which Christ has become the source of a grace given to those who believe in him and are made participants of divine life itself. 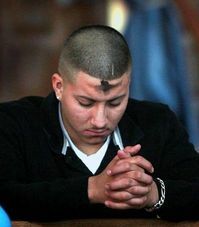 This life which will have no end is already present in the earthly phase of our existence, but will be led to fulfillment after the “resurrection of the flesh.” The little gesture of the imposition of ashes reveals to us the singular richness of its meaning: It is an invitation to live the time of Lent as a more conscious and more intense immersion in the Paschal Mystery of Christ, in his death and resurrection, through participation in the Eucharist and in the life of charity, which stems from the Eucharist and in which it finds its fulfillment. With the imposition of ashes we renew our commitment to follow Jesus, to allow ourselves to be transformed by his Paschal Mystery, to overcome evil and do good, to have the “old man” in us die, the one linked to sin, and to have the “new man” be born, transformed by the grace of God. Dear friends! While we hasten to undertake the austere Lenten journey, we want to invoke with particular confidence the protection and help of the Virgin Mary. May she, the first believer in Christ, be the one who accompanies us in these 40 days of intense prayer and sincere penance, to be able to celebrate, purified and completely renewed in mind and spirit, the great mystery of her Son’s Easter.